Thousands of people do not have access to basic toilet facilities in their workplace says the union, Unite. The UK’s biggest union reported evidence of staff at branches of high-street banks being required to use buckets, and construction sites failing to provide any female facilities. Bus drivers had been denied loo breaks for up to five hours, and workers in call centres for big institutions were told to clock in and out to take a break. 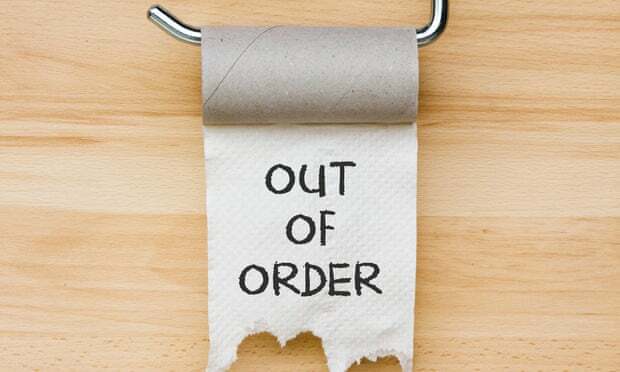 Unite claims tens of thousands of workers across the UK suffer a lack of “toilet dignity”, where they are either not provided with proper facilities or have restrictions placed upon them when taking a break. The union said it was demanding that employers take action to ensure that workers had decent facilities without unnecessary restrictions. Women in particular were likely to suffer, said Unite, which launched a “period dignity” campaign in September to highlight issues in workplaces. It said problems experienced by many UK workers on a daily basis potentially had serious health risks and could exacerbate many conditions, but that employers were continuing to breach health, safety and welfare duties by not providing proper facilities. “It is simply staggering and clearly deeply humiliating for the workers who are being denied toilet dignity. Employers have got absolutely no excuse for ensuring toilet dignity and if they fail to do so they should be prosecuted by the Health and Safety Executive. Unite’s research has been published to tie in with World Toilet Day on Monday 19 November. The organisers of the event say that 4.5 billion people across the world live without a safe toilet, and 1.8 billion use drinking water sources that may have been contaminated.